Russell's Full Flow design hose ends have been the choice of many racing professionals for more than 30 years. Full Flow Hose Ends feature a unique tapered design for easy assembly and are mandrel bent for superior flow. They are designed with the traditional 37° AN angled sealing surface for that positive anti-leak seal and will not require the use of a sealing compound or PTFE tape, guaranteed! Russell's Full Flow Swivel Hose Ends swivel 360-degrees to maximize hose installation allowing for quick alignment of ends after hose assembly. 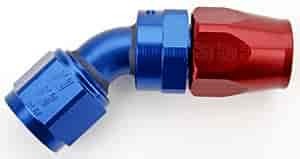 All Full Flow Hose Ends are made from lightweight aluminum and are completely reusable. Designed to be used with Russell ProFlex, ProRace, ProClassic and ProClassic II Hose. 613110 is rated 5.0 out of 5 by 1. Rated 5 out of 5 by jreese02 from Just what I needed Worked perfectly and simple to install. Would like to see a smaller hex but I understand this is based on an old standard.